In the past, we’ve written a lot about ripping your DVDs in order to watch them on an iPhone or an Apple TV. The most-recent version of HandBrake makes it pretty easy, and my colleague Christopher Breen recently posted a Macworld video that walks you through the ripping process. All of the stuff we’ve covered is great for ripping standard DVDs, but unfortunately none of those applications works with Blu-ray discs. Now that Blu-ray players are becoming more common in the living room, so are the Blu-ray movies we watch on them. 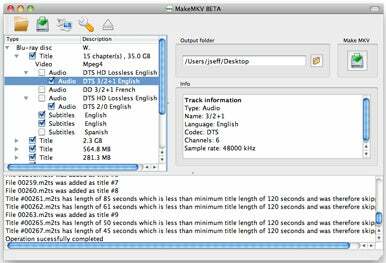 To see if I could rip a Blu-ray disc, I downloaded the free MakeMKV beta, a DVD- and Blu-ray-ripping application for OS X and Windows. I borrowed a Buffalo Technology MediaStation 8X External Blu-ray Writer ( ) from the Macworld Lab, inserted the Blu-ray version of Oliver Stone’s W., and launched MakeMKV. The software immediately found my USB-connected drive, and let me read the Blu-ray disc inside. It then presented me with a list of titles, each with a file size next to it. The first title was the main movie—easy to tell because it listed the number of chapters and also displayed the largest file size of the group at 35GB. Clicking the disclosure triangle next to that title showed me the various audio and subtitle tracks contained in the movie, and let me deselect those I didn’t want. I then clicked the Make MKV button and, about an hour and a half later, ended up with a 31.79GB .mkv file on my hard drive. MakeMKV basically strips the copy protection from movies and then copies them into an MKV container. The result is a perfect copy of the movie, at its original frame size and data rate, which I was able to play on my Mac Pro using the free VLC media player. However, the file won’t play on any Apple device (even if you had room for it). Unlike HandBrake, MakeMKV doesn’t do any transcoding, so if you want to watch the movie on your iPhone or Apple TV, say, you’ll need to convert it with a separate app, such as the free VideoMonkey—which takes even longer than the original Blu-ray ripping process. Another app I found, usually referred to as Blu-ray Ripper for Mac, appears on many different Websites with slightly different names and pretending to be from different companies. They’re all the same garish, $49 app, however. On the plus side, they let you extract and transcode elements from Blu-ray movies in one step. But at least with the trial version I used, the results weren’t very good. In general, I advise steering clear of such costly, generic ripping software. It’s early days for Blu-ray ripping, especially on the Mac, but it does seem like there’s progress being made to let us enjoy our purchased movies on our other devices, regardless of format.